Airline describes strike as 'entirely unjustified', with Belgium, Spain and Portugal flights the most heavily affected. A strike by cabin crew in Belgium, Portugal and Spain has forced Ryanair to cancel up to 600 flights on Wednesday 25 and Thursday 26 July. The airline issued an official statement, apologising to thousands of customers whose travel plans will be disrupted next week by the strikes. 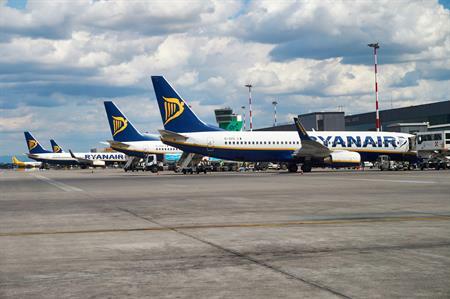 "Ryanair sincerely apologises to our customers for these disruptions which we have done our utmost to avoid," said Kenny Jacobs, chief marketing officer at Ryanair. "Given that Ryanair cabin crew enjoy great pay – up to €40,000 (in countries with high youth unemployment) – industry leading rosters (14 days off each month), great sales commissions, uniform allowances and sick pay, these strikes are entirely unjustified and will achieve nothing other than to disrupt family holidays, and benefit competitor airlines in Belgium, Portugal and Spain." "All affected customers have been contacted by email and SMS text message and we will re-accommodate or refund all of those whose flights have been disrupted."